The city of Greensboro has been the backdrop to a number of anti-racist and civil rights struggles. Most famously in 1960 four students from North Carolina Agricultural and Technical College (A&T) organised a sit-in at the “all white” Woolworth’s lunch counter. Over 1,400 people were jailed in the campaign to desegregate the Greensboro Woolworth’s. Spurred on by the victory of the Woolworth’s desegregation campaign in 1963, thousands of people took to the streets every night demanding the desegregation of all the city’s “whites only” businesses. In 1979 a small group of activists belonging to the Communist Workers’ Party (CWP) began organising in the city. The CWP was a tiny Maoist organisation. In Greensboro the CWP’s sectarian politics cut it off from all the other political and civil rights groups in the state. The CWP focused on unionising textile workers. It developed an “industrial enterist” strategy. Some CWP members got work in the mills and attempted to recruit workers to the union and revolutionary politics. For example CWP member Dr James Waller left his medical practice to become a textile worker and quickly became president of the local textile workers’ union. These efforts brought the CWP into conflict with a local chapter of the Klan and the American Nazi Party. The CWP produced anti-KKK propaganda and disrupted Klan meetings, including a KKK screening of DW Griffith’s racist 1915 film The Birth of a Nation. 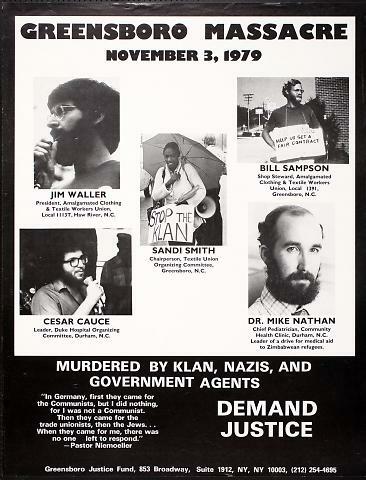 As part of its anti-KKK campaign, the CWP organised a “Death to the Klan” march in Greensboro on 3 November. By 1979 the KKK was a pale imitation of the racist organisation that terrorised the Civil Rights Movement of the 1950s and 1960s. It had about 4,000 to 5,000 members. It did, however, maintain links with sections of the establishment and did on occasion carry out violent attacks on black people and on whites who opposed it. These attacks could be deadly. Following a KKK initiation ceremony in Chattanooga, Tennessee in 1980, for example, three KKK members shot and killed four elderly black women – Viola Ellison, Lela Evans, Opal Johnson and Katherine Johnson. The anti-Klan protestors assembled in a predominantly black housing estate, Morningside Homes, and the plan was to march to the Greensboro City Hall. Around 30 or 40 protestors turned up. They were a mix of CWP members, local black residents and a number of young black children wearing red berets. Local TV news crews and radio reporters gathered to film the march. As demonstrators congregated, ten cars and vans with approximately 40 KKK and American Nazi Party members drove past the protestors. Suddenly, the vehicles stopped and the KKK and Nazis emerged from the cars with guns and began shooting protestors. After firing for nearly two minutes the attackers drove off. • Cesar Cauce, a Cuban immigrant and CWP member. • Dr Michael Nathan, chief of pediatrics at Lincoln Community Health Center, a clinic for children from low-income families in Durham, North Carolina. He was wounded in the shooting and died two days later in hospital. He was not a member of the CWP. • William Sampson, a graduate of the Harvard Divinity School and a medical student. He helped organise the union at one of Cone Mills’ Greensboro textile plants. • Sandra Neely Smith, a CWP member and president of the student body at Greensboro’s Bennett College. She was a nurse and used her skills to help sick textile workers. One of the central claims of the surviving demonstrators was that the Greensboro police colluded with the racists. A number of accepted facts seem to substantiate this claim. First, unlike every other anti-KKK protest at the time, no police were present at the assembly point. 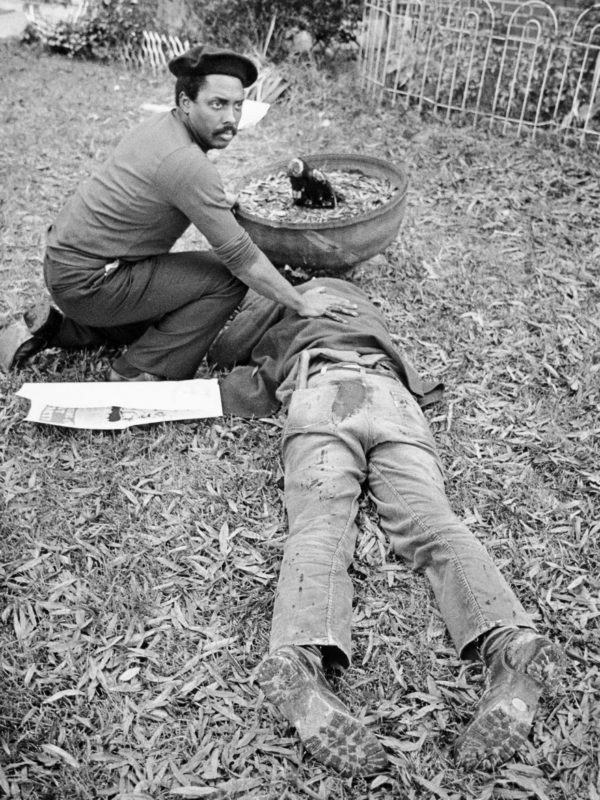 It is also acknowledged by the Greensboro police authorities that Edward Dawson, a paid police informant, was in the lead car that took part in the Greensboro massacre. Dawson admits that he was given a copy of the march route by a local police officer, and that he and a KKK leader rehearsed driving the route the night before so they would be familiar with it. The FBI’s investigation into the Greensboro Massacre resulted in the arrest of five members of the KKK. They were charged with murder. At their trial in 1980 they claimed that they had acted in self-defence and an all-white jury acquitted them. But in 1985, a civil jury found the city of Greensboro, the KKK, and the American Nazi Party liable for violating the protestors’ civil rights. The city of Greensboro paid $350,000 to the injured and the families of the people who were killed. But the fact remains that the men who murdered five protestors walked free and went unpunished. Today the cold-blooded murder and Nazi terror in Charlottesville have sparked a completely different response. Protests against the Nazis have erupted all over the US and the Nazis have called off dozens of planned protests. And Donald Trump’s attempts to portray anti-racists and Nazis as two sides of the same coin have led to one of his biggest political crises. So while we march against the rise of the Nazis in the US, protest against Trump’s racism and join vigils to remember Heather Heyer, let’s also remember the Greensboro protestors and all the other victims of the KKK and the Nazis. This is a short film showing what happened that tragic day. (Warning: violent content).